Jake Osher, more popularly known as Jayceeoh, is a Los Angeles based Producer/DJ and world-renowned turntablist. In 2014, Jayceeoh gathered support from the likes of A-Trak, Diplo, Bassnectar, Borgore, The Bloody Beetroots, MAKJ, and TJR, to name just a few. His bass heavy production has also captured the attention of the music industry as a whole, and some of the largest online music platforms such as Dancing Astronaut, THUMP, Vibe Magazine, Gotta Dance Dirty, Run The Trap, and Earmilk. His debut original release titled “DAMN,” a collab with fellow tunrtablist, DJ Scene, released on “Fools Gold Records” in November of 2013. Since then, he’s seen releases on Dim Mak, Buygore Records, Smog Records, Ultra Records and Atlantic Records. Some of his more notable collaborations include SBCR (The Bloody Beetroots), Caked Up, Styles&Complete, Riot Ten and others. In addition to these official releases, Jayceeoh was also crowned champion of VH1′s “Master of the Mix” TV show in mid-2013 after competing on 10 episodes on the network. In the club circuit and live performance realm, Jayceeoh has maintained premier residencies for years across the country in some of the most notable venues in the United States. He’s also been afforded the opportunity to play in over 32 countries worldwide and on some of the biggest stages, including iHeartRadio Festival in Vegas, TomorrowWorld in Atlanta, EDC Mexico, Fresh Island Fest in Croatia, Das Energi in Salt Lake City, Lights All Night in Dallas, Hellow Festival in Mexico City, and Empire Music Festival in Guatemala. 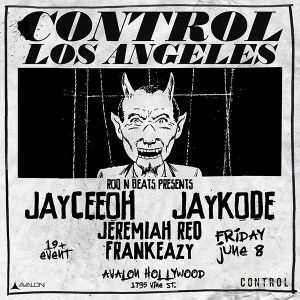 Jayceeoh also headlines regularly in Las Vegas at Drai’s Nightclub, The Light Nightclub, and DayLight Pool at Mandalay Bay. As an LA native, he’s made headline appearances at Create Nightclub, Avalon, and Sound Nightclub, to name a few.